Following the death of longtime Cuban leader Fidel Castro on November 25, President-Elect Trump used his Twitter account to denounce the man he described as a "brutal dictator." He also renewed his criticism of the normalization deal the Obama Administration struck with the communist island. On the campaign trail, Trump noted that because Obama initiated the deal through an executive order, the next president could reverse the deal. On November 28, Trump tweeted: "If Cuba is unwilling to make a better deal for the Cuban people, the Cuban/American people and the U.S. as a whole, I will terminate deal." Just two weeks before the presidential election, officials at Roswell Park Cancer Institute in Buffalo were joined by Governor Andrew Cuomo to celebrate a partnership with the Center for Molecular Immunology, based in Havana, through which the Buffalo center would begin clinical trials of a lung cancer vaccine developed by the latter. Given Trump's tweets, the question was presented to Dr. Candace Johnson, president and CEO of Roswell Park Cancer Institute: is there cause for concern for the future of the partnership? Johnson told WBFO the short-term answer is no. "This collaboration with the Cuban scientists and physicians really was initiated when Cuba was in total lockdown," said Johnson, who added that Roswell Park officials acquired permission from the Food and Drug Administration and U.S. Treasury Department to proceed with their partnership. The Center for Molecular Immunology developed the vaccine CIMAvax to battle lung cancer. Johnson says it shows promise in treating other forms of the disease, including breast, colon and prostate cancer. Clinical trials are expected to begin later this month, just before Christmas. 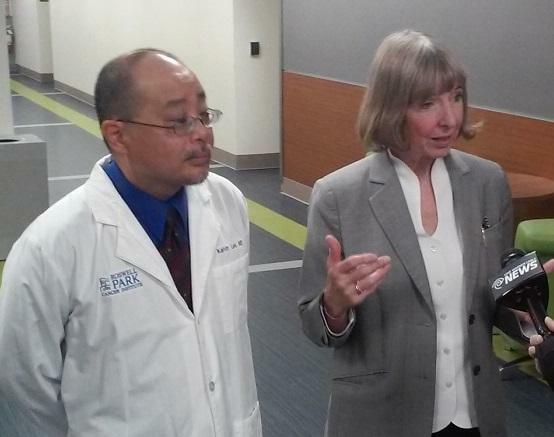 Roswell Park Cancer Institute president and chief executive officer Candace Johnson speaks with WBFO's Michael Mroziak about the center's partnership with the Center for Molecular Immunology, forthcoming clinical trials on a lung cancer vaccine developed by the Havana-based institution, and whether threats by President-Elect Trump to reverse the Obama Administration's normalization efforts jeopardizes the partnership. There was plenty of excitement at Roswell Park Cancer Institute Wednesday morning, as President and CEO Candace Johnson made what she called two "historic" announcements that "represent new hope for patients with lung cancer." The Buffalo-based hospital and research center will become the first such institution in the U.S. to test cancer drugs developed in Cuba. Just weeks after the interim tag was removed from her title, Dr. Candace Johnson, President and CEO of Roswell Park Cancer Institute, took part in an historic trip to Cuba. The journey provided a memorable start to the new leader's ambitious agenda for the legendary institution.